Finally some Indepent Characters are getting done. 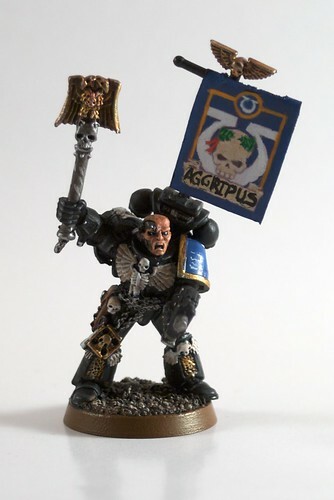 Chaplain Aggripus is the first to get a finished touch. One of the things I tried with this model is doing a banner. 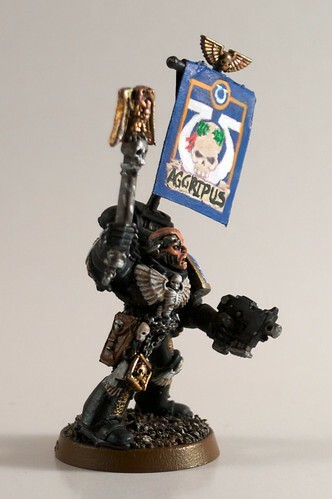 One of the things I like about the 40K lore is that characters wear ‘come get me’ banners. Its totally against what the modern army would use, but dang it looks cool 38 thousand years from now! One of the things I need to do is to glue down banner as I see that slides around while in his storage facility. Other than that I like the banner, a lot. Oh, and my secret? Glad you asked, because it is simple. I printed out a banner from Games Workshop and using Photoshop I shrunk it down to size suitable for the model. After that I painted over the banner so that it looks more free form and doesn’t look like I printed off a banner. Perfect for the person (like me) who can’t paint or draw in freeform!